During February–March 2006, a survey prior to development was conducted in the Ramot Forest of the Ramat Shelomo neighborhood in Jerusalem (Permit No. A-4716*; map ref. NIG 22000–225/63475–650; OIG 17000–225/13475–650). The survey, carried out on behalf of the Antiquities Authority and financed by the Moriya Company, was performed by A. Eirikh-Rose and M. Birkenfeld, with the assistance of Y. Baruch and O. Barzilai. Approximately 75 dunams (Fig. 1) were surveyed in the Ramot Forest in northern Jerusalem. Two main ruins were found, Kh. el-Masani (cf. A. Kloner 2000, Survey of Jerusalem: The Northeastern Sector, Site 137), in whose precincts the remains of a rock-hewn church, buildings and agricultural installations were documented, and Kh. 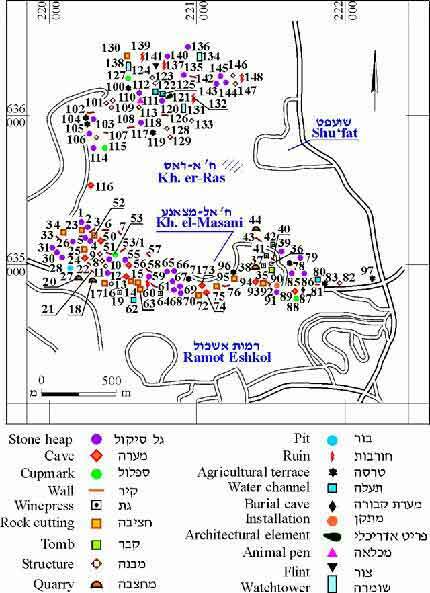 er-Ras (Survey of Jerusalem: The Northeastern Sector, Sites 102–103, 112–114, 116–118) where an impressive rock-hewn burial cave and a large complex of quarries were discerned. One hundred forty-six sites were documented, among them the remains of buildings, cisterns, rock-hewn installations, burial caves, quarries, stone clearance heaps and a complex system of terraces. Some of the sites date to the Second Temple period. In addition, an area where an extensive scatter of flint implements, whose dates have not yet been determined, was surveyed. At Kh. 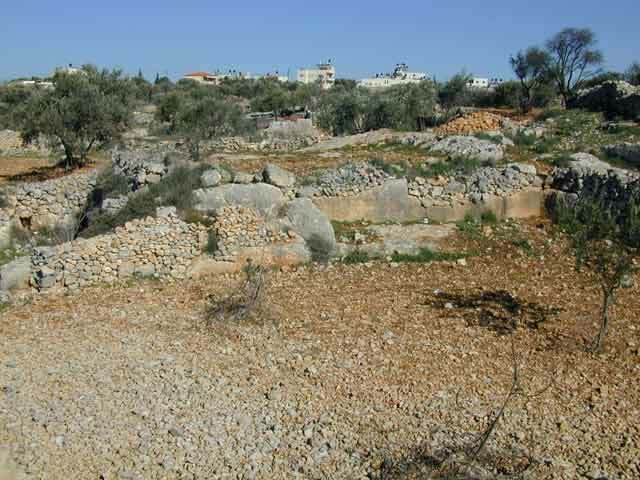 el-Masani remains of a hewn church (Site 60), which was documented in the Survey of Jerusalem and subsequently excavated (‘Atiqot 40:17*–23*), were found. Next to the church were massive walls and various agricultural installations, such as cisterns and other rock-hewn installations, which indicate a monastery was probably located there. South of Shu‘fat, an impressive burial cave (Site 87; Fig. 2) that was also documented in the Survey of Jerusalem (A. Kloner 2000, Survey of Jerusalem— The Northeastern Sector: Site 117) was surveyed. The cave, incorporated into a large stone quarry, has a large courtyard and a round opening that is decorated with incisions. Other rock-hewn caves (Sites 24, 25, 73, 74, 89) were surveyed, some of which were probably used for burial. Four natural caves (Sites 13, 50, 94, 116) that were used by shepherds as dwellings and/or storehouses were also found in the area. The most striking finds in the eastern sector of the survey were the large stone quarries that extended across an extensive area. Some of them were terraced while others were courtyard quarries. Among them, the more elaborate ones located south of Shu‘fat (Sites 38, 44; Fig. 3) covered a large area with vertical walls that stood 3 m high (A. Kloner 2000, Survey of Jerusalem— The Northeastern Sector, Site 116). 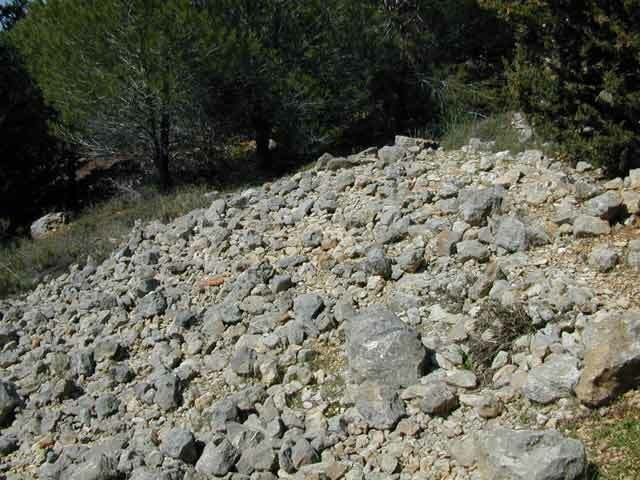 A smaller quarry was found in the southern sector (Site 92) and isolated rock-cuttings were noted throughout the surveyed area (Sites 14, 15, 17, 18, 20, 34, 72, 130). 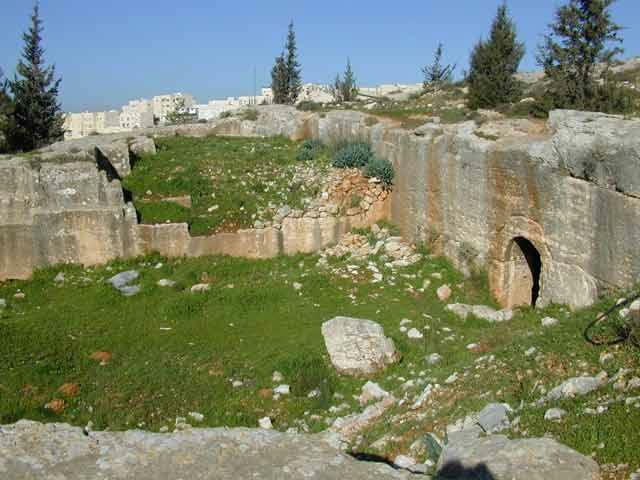 Agricultural installations were identified in the survey, including rock-hewn cisterns (Sites 27, 62, 80); in one site (62) the remains of a hewn aqueduct that conveyed water to a cistern were discerned. In the southern region five winepresses (Sites 19, 35, 41, 42, 64) were discovered. A number of rock-hewn installations (e.g., Site 90) were documented, as were several cupmarks (Sites 53, 88, 115, 127), whose dates are unclear. Various buildings were documented in the survey (Sites 9, 16, 82, 101, 109–111, 113, 124, 128, 131–133, 137, 146), some of which can be identified as field structures and watchtowers. Most were located in the northwestern sector where a number of buildings with massive walls were identified; large amounts of pottery dating to the Iron Age and the Roman–Byzantine period were scattered around them. Stone clearance heaps (Fig. 4) were documented in the survey areas; these ranged from several meters to 10–12 m in diameter (Sites 1, 2, 5, 10, 12, 28, 31, 39, 55, 59, 65–67, 69, 70, 79, 85, 86, 91, 103, 106, 112, 114, 118, 120, 135, 136, 140, 143–145, 148). Enclosure walls could be discerned in some of them. Only in a few of the heaps were potsherds discovered, usually dating to the Byzantine period. Terrace walls were documented on most of the slopes; some were up to c. 100 m in length, while others were shorter (Sites 3, 6, 7, 11, 21, 22, 33, 40, 43, 57, 58, 71, 76, 78, 81, 83, 92, 96–97,100, 102, 104, 105, 107, 108, 117, 119, 123, 125, 126, 142). Most of the terrace walls were preserved one–two courses high. Walls delimiting cultivation plots and/or animal pens were documented across the slopes. Two dense concentrations of finds that were not connected to architectural remains were found in the surveyed area. One, in the southeastern sector, contained a large amount of Roman–Byzantine pottery and flint items, while the other, in the northwestern sector, consisted of a large amount of non-diagnostic flint items (Site 141). A fairly extensive concentration of sites was documented in the survey. In most instances it was not possible to determine the exact boundaries of the sites or to date them with precision. In any case, the region was inhabited for many centuries, during which it served as part of the agricultural hinterland of Jerusalem. 1. Map of the survey sites. 2. Site 37, burial cave at Kh. er-Ras. 3. Sites 44–45, quarries at Kh. er-Ras. 4. Typical stone clearance heap.